Michelangelo Brutus is a bust made by the great artist in Rome in 1539-40, visible today in Florence at the Bargello Museum. Like most of the works by Michelangelo, Brutus is a symbolic work: depicting the man who killed Julius Cesar, the first Roman Emperor after centuries of Republican government, Michelangelo wants to represent a symbol of freedom and rebellion against tyrants, comparing the story of Julius Cesar and Brutus with what was just happening in Florence Italy. In Dante’s Inferno, written in the early 1300s, the “divine poet” reserves a place for Brutus among the worst sinners of the human history. The three-headed devil in the center of Earth is eating Judas, traitor of Jesus Christ, and Brutus and Cassius, traitors of Julius Cesar. So, how comes that now Brutus represents freedom? Michelangelo compares the ancient history of Rome with the recent history of Florence: as Julius Cesar was the first Roman Emperor, Alessandro de Medici was the first Florentine Duke. Both cities had been Republics for centuries before turning into Monarchies. Julius Cesar was assassinated by Brutus: in Renaissance Florence, Duke Alessandro was assassinated by Lorenzino de Medici. Brutus was an adopted son (the favorite) of Julius Cesar: Lorenzino was a cousin (the favorite) of Alessandro. 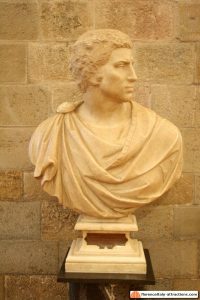 The bust was commissioned to Michelangelo by a friend, Donato Giannotti, for the Cardinal Niccolò Ridolfi. Both Giannotti and Ridolfi were part of the republican faction in exile from Florence, opposing the Medici family. Michelangelo, who started his career thanks to the Medici family (in particular thanks to Lorenzo the Magnificent), soon turned into a Republican: he didn’t have any sympathy for the Medici Popes (even though he worked for them) and in the two occasions when the Medici were banished from the city, he actively helped the Republic of Florence to stay free from the Medici tyrants. Ironically, in 1590 the work became property of the Medici, specifically of Ferdinando I Grand Duke of Tuscany, and was placed in the Medici Villa of Petraia, then in the Uffizi Gallery and finally in the Bargello Museum. In his Lives, Giorgio Vasari (who is dedicating the book to the successor of Alessandro, Cosimo de Medici), conveniently avoids to describe the hidden meaning of this work: “… a head of Brutus in marble with the chest, considerably larger than life, … Of this the head alone was carved, with certain most minute gradines, and he had taken it from a portrait of Brutus cut in a very ancient cornelian that was in the possession of Signor Giuliano Cesarino; which Michelangelo was doing for Cardinal Ridolfi at the entreaty of Messer Donato Giannotti, his very dear friend, and it is a rare work.” Is Michelangelo Brutus a portrait of Lorenzino the Medici? Probably it isn’t, considering that Michelangelo didn’t use to make realistic portraits (like for the tombs in the Medici Chapels).